Acetylene is a colourless, flammable gas. It is used in Oxygen fuel cutting and welding/brazing applications. Its’ primary flame temperature is at 6300 deg. F.
Ammonia is a colourless, pungent, toxic gas. Ammonia is mainly used in the metal heat treating for nitriding, carbo-nitriding, furnace bring and other applications where protective atmospheres are required. Argon is a colourless, odourless, tasteless and non-toxic gas. Argon is an inert gas used to displace impurities in the metal forming and casting industries. In welding it is used as a shielding gas to create an optimum environment for the weld pool in MIG and TIG welding processes. Carbon Dioxide is a tasteless, colourless, odourless, non-flammable gas. It is primarily used in welding applications. It is also used in preserving certain foods. Helium is a colourless odourless, tasteless and nontoxic and non flammable gas. Helium is used as a shield for the weld pool in welding applications. It can be used on its own or mixed with Argon and Carbon Dioxide. With the addition of Helium in the weld pool shield, on will find welding travel speeds and penetrations increased. Hydrogen is a colourless, odourless, flammable gas. Hydrogen is used in the metal processing industry to protect the environment of the metal production state. It is also mixed with Argon in welding applications to provide protection of the weld pool. Hydrogen also provides extra performance in cutting applications. Nitrogen is a colourless, odourless, tasteless and non-toxic gas. Nitrogen is mainly used as a purge gas. It can also be used in food packaging for freezing and preserving. It is also used in some plasma cutting applications, and heat treating production. Nitrogen is the most plentiful gas in our atmosphere which is comprised of 78% Nitrogen. Oxygen is a colourless, odourless and tasteless gas. Out atmosphere is comprised of 21% Oxygen. 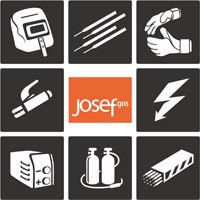 Oxygen is used in oxy-fuel cutting and brazing applications, as well as in plasma cutting applications. Oxygen is what makes combustion possible. 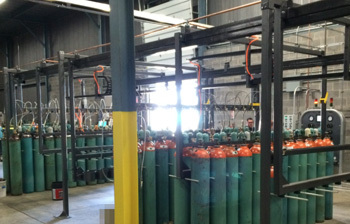 Oxygen is also used in small amounts when mixed with Argon and Carbon Dioxide for shielding the weld pool in Mig and Tig welding applications. It is also used in food packaging. Propane is a colourless, flammable, liquified gas. Propane is used in oxy-fuel cutting applications. Propane is used as a carburant in Propane powered forklifts frequently used in the warehousing and logistics industries. Propane is also used for home heating and temporary construction hearing applications.